You’re driving to Neville, OH. We’re camping on our camp property. It’s gnarly and awesome, and incredibly primitive. The parking address is 420 Neville-Penn Schoolhouse. You’ll be parking and hiking in from there. On Neville-Penn Schoolhouse Rd the entrance is on the right about 1.3 miles from the turn off US-52 in Neville, OH. Pick a rendezvous for your unit. This spot is your responsibility to find, and needs to accommodate everyone’s cars all of Saturday, until you’re back on Sunday. DO NOT use a Crossroads parking lot, because we need those spots for the weekend. Allow plenty of time to get there. If you meet somewhere in Oakley, you’re about 50 minutes away. We need you to be on time. Plan well. Get your unit there in no more than TWO vehicles (we’ll allow three if you have more than 10 men in your unit). One of the marks of manhood is working as a team—do not let your unit take ten separate cars to camp. We won’t have room for that many, anyway. 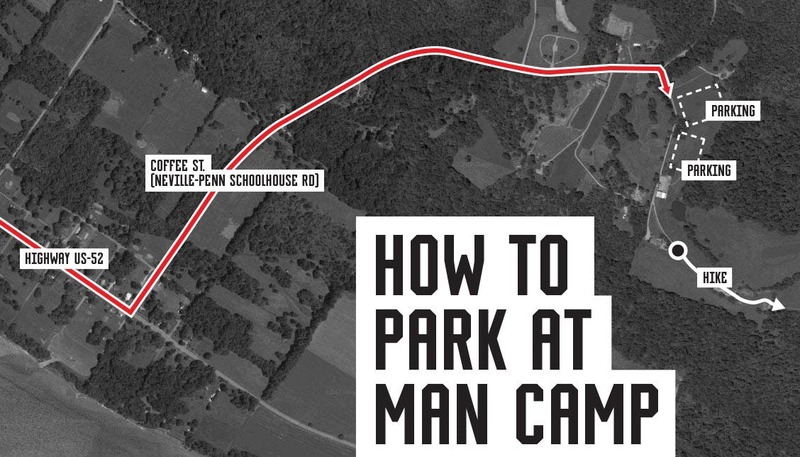 Look for MAN CAMP signs when you get close. But make sure you’re clear where you’re headed before you leave. Print out a map, bring it up on your phone, punch it into your GPS. There will be a marked entrance to our property on the right side of the road. You’ll enter there, and we’ll have guys showing you where to park. Don’t bring a trailer. You don’t need a trailer. Coolers are also heavily discouraged. You have about a mile to hike once you park. Bring only what you can carry with you. What to do when you arrive. Trip Captains, look for a registration table (it’ll be the only table in sight). You’ll sign in and get instructions there. The rest of the unit - Get your gear out of the car and wait to hear from your Trip Captain for further instructions.